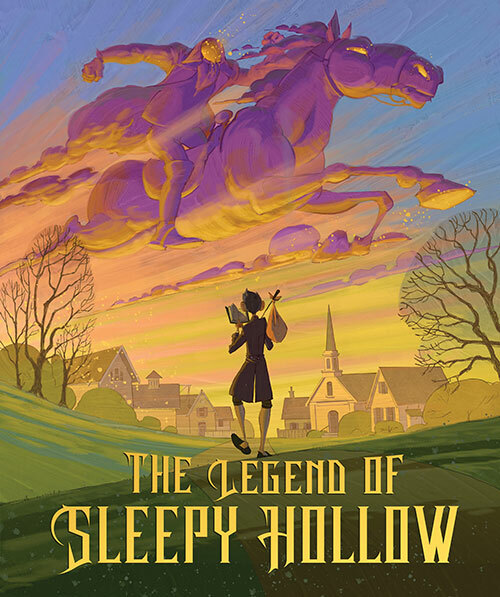 Washington Irving’s classic tale comes to life as the Arkansas Arts Center Children’s Theatre continues its 2015/2016 Main Stage season with The Legend of Sleepy Hollow, October 23-November 8. The Legend of Sleepy Hollow is an American Halloween classic. Gremlins, ghosts and galloping headless horsemen will haunt audiences Fridays at 7 p.m., Saturdays and Sundays at 2 p.m., October 23 through November 8. It is recommended for third grade and up. Ichabod Crane is the newly-hired schoolmaster of Sleepy Hollow, a superstitious little community in New York’s Hudson Valley, 1790. He persistently professes his disbelief in all things supernatural—until the night of Katrina Van Tassel’s Halloween Frolic, that is. Riding home that evening, Ichabod comes face to face—so to speak—with Sleepy Hollow’s most feared and famous ghost. and Sarah Tennille of Little Rock, and Max Green of North Little Rock. Adapted by Frederick Gaines from the story by Washington Irving, it is directed by John Isner. Bradley Anderson is the artistic director. Costumes are designed by Erin Larkin, technical direction by Drew Posey, lighting design by Mike Stacks, properties design by Miranda Young and Sarah Gasser is the stage manager.